Texas A&M Football's 2019 Maroon & White Game has been moved up to Friday, April 12 at 7:30 pm due to impending inclement weather. Texas A&M Football's 2019 Maroon & White Game has been moved up to Friday, April 12 at 7:30 pm due to impending inclement weather, according to a press release from the university. The game was originally set to take place on Saturday, April 13 at 1 pm. 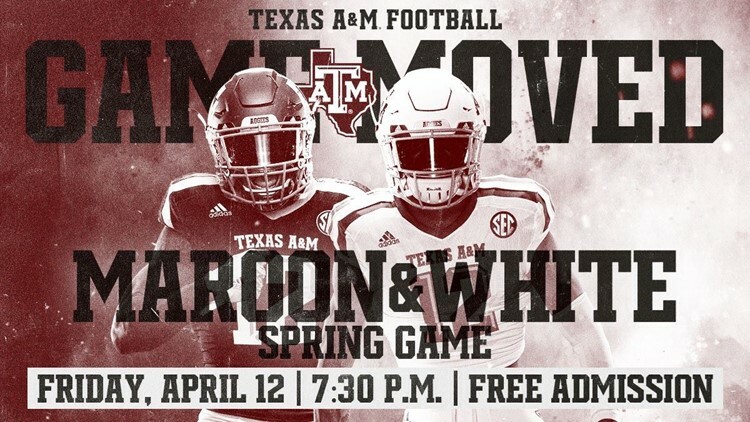 The Maroon & White Spring Game is now a free event and refunds will be issued to fans who purchased tickets to the game, according to the press release.